Tea party: The story in words and pictures. The idea of having a tea party where we invited everyone, came from the children. It all started in the play kitchen in the nest, where Maya and Rosie were playing together. Maya really wanted real tea with water, and all to happen in the play kitchen. While this is something we sometimes do, the opportunity to make real tea is never passed on at Wheelhouse. We have some tea loving teachers at school, and will often add tea to our morning snack, specially on chilly mornings. So when Maya ran into the sink to get water for pretend tea; I said, Hey, Maya you know we can make real tea at school. Her response: "Yeah!! A tea party, we can invite everybody." And that is how it all started. The days that followed were spent learning about the teas we had already at school, taking them in with all of our senses. Smelling them, noticing what happened when the tea bags went into the water. And tasting them to decide what was coming to the tea party. Karika: This one is sweet! Marian: Mmm berries! Can you warn all the mothers to come and stay because the tea party is today?!!! Kora: I think daddy is going to come. Rylee: Mine smells like broccoli. I like broccoli. Claire: It go into my nose and my boogers turn into minty spicy! Rylee: I have tried peppermint before, you are going to love it Marian! Irina: And what do you think of chamomile? Karika: Is yucky, is spicy. Claire: Mmmm is like chocolate. After smelling the teas present at the table we decided to get cups and hot water and actually make the tea. We talked about how when you keep the tea for a longer time in the water, the tea can taste stronger and that removing it earlier makes it more mild. Marian: I want not spicy. Rylee: I like mine that taste like leaves. What I love more about this project , is how throughout the week, different children participated in the process, and how some of those children drove the experience sometimes and other times other children drove the experience. By the day when we made cookies in the cafe, destined to be served at the tea party, we noticed the word had travel. There was a big group of children interested in being part of the tea party planning. Through all of it, we were able to facilitate a sensory exploration when tasting the teas and smelling them. By writing menus, children worked on literacy skills in emergence and with a purpose, rather than just because those skills are important to learn. By facilitating daily experiences of life in which children can practice all kinds of skills, literacy, sensory, gross motor, we adjunct to the idea of learning as living and the idea that we are all learning everywhere all the time. Also there was a sense of community of all working towards one goal together, and taking it to the end result: Having the tea party at pick up time, when families stayed a little longer to enjoy tea and cookies with us. Unfortunately, we don't have any images from the actual tea party, but we do have a video of children making cookies that I think you will enjoy. We look forward to continue to create projects like this, within our Wheelhouse community of children and families. Inspired by two favorite stuffed animals, a turtle and an alligator, children have become interested in learning more about water habitats. We have begun by starting a study of the pond near our school. In just two initial visits, children have already made all kinds of fascinating observations about the natural world nearby. One of the most readily observable features of our pond during this chilly end-of-winter time is the plants. They have also started thinking about animals, and wanting to know more. They have made discoveries about the physical properties of water, and applied their prior knowledge to this new situation. Children naturally observe and remark on mathematical relationships as they observe the world around them. "Who has the longest one?" 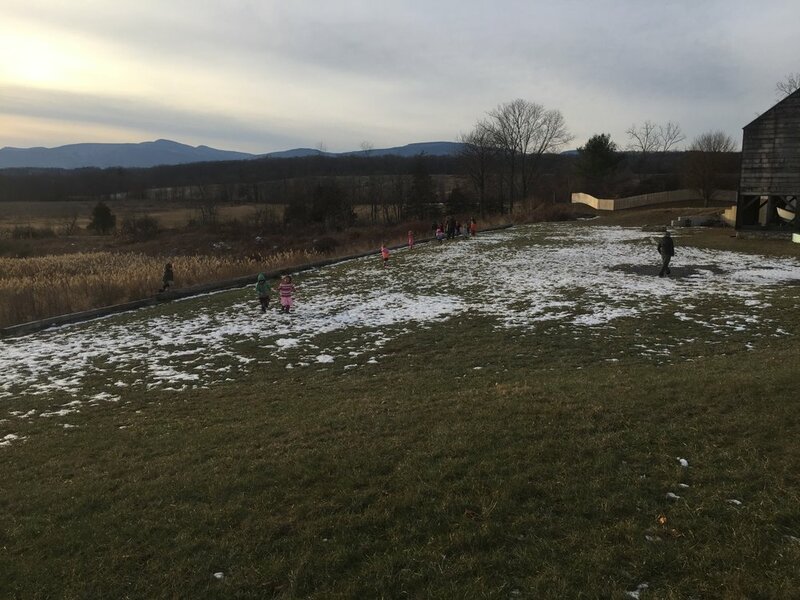 These types of experiences are important because they incorporate many types of learning while promoting an authentic connection to nature, which serves both children and the ecological environment. Children hone their observational skills, engage in scientific inquiry, and explore botany and zoology. Opportunities for measurement, collecting data, and gathering information to answer their own questions abound. Opportunities for creativity and poetry are intertwined, as children are inspired by what they see to capture the world with novel words, and to create their own drawings and artwork. As we continue with our pond investigation, we will weave in opportunities for children to represent their thinking through drawing, writing, and we plan to eventually use found materials to create our own pond complete with plants and wildlife on a big piece of cardboard. We will integrate the languages of math, science, and art, as children learn about and share their knowledge of the world around them. We look forward to sharing our continued learning with you! Hello Everyone!! Today is another snow day, so I thought it would be a fun moment to share with you some of our snow explorations together at school!! We've had a lot of snow this winter, which has meant lots of different types of explorations for the children- sledding, snow angels, snow sculptures, shoveling snow, eating snow, and experiencing the various states of water that can occur as it snows, rains, experiences of wintery mixes, and the types of snow and ice that form. One thing I am personally grateful for is the terrain of the land we are on. There are rolling meadows, wild forests, and some nice small hills. 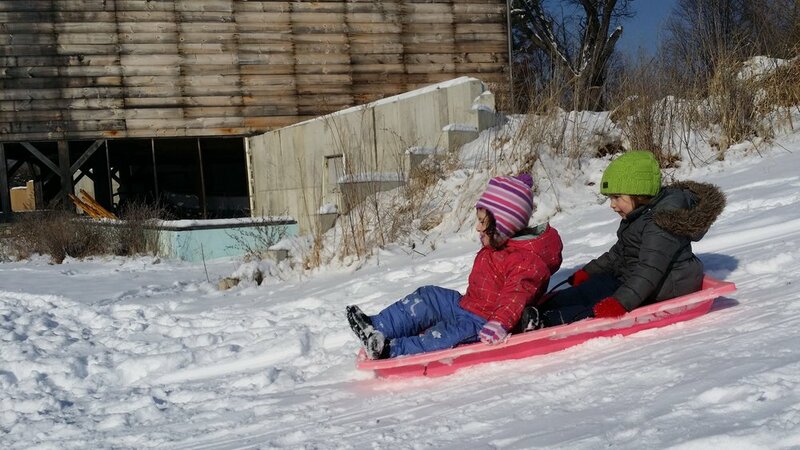 There are a few spots that we've found with the children that are perfect for sledding. 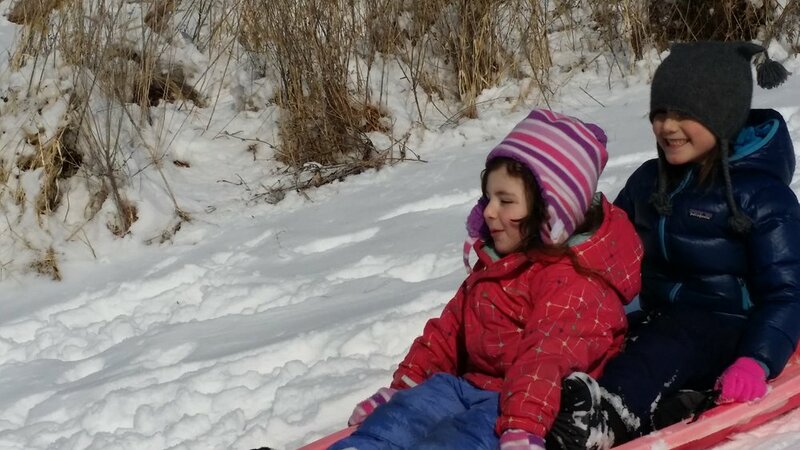 Sledding together is an amazing experience as a class. It involves many different types of social skill building, physical work, sensory experiences, and, pure joy. Socially, the children are figuring out a system of sharing the sleds, working out where are the places to walk up and where to sled down, bonding together as they share a ride together, and especially as they talk each other through moments of intense feelings about the experiences. Many times, a child may feel a little overwhelmed with the excitement, the cold, the energy of the others, and its in these moments you see the children step in to help one another, really showing how they care for one other. 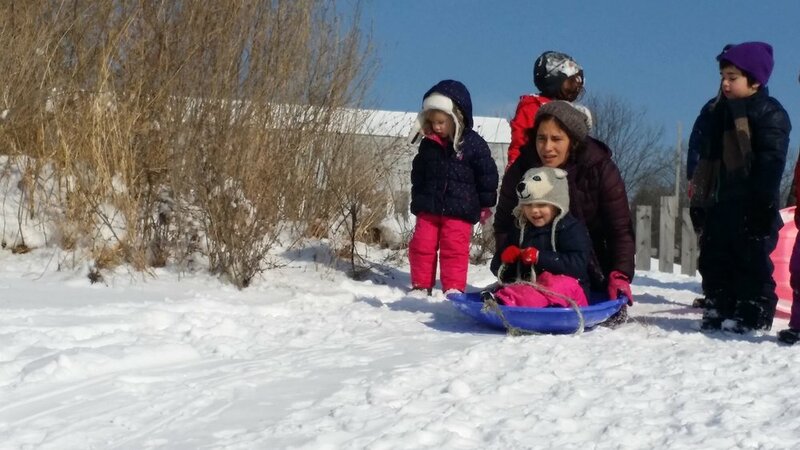 One of the best parts of the sledding experience as a class is that though they each get to take a ride on the sled, they really enjoy chasing the sled as it goes down the hill!! For many children, this was more exciting and fun, as they squeal with glee, running together as fast as they can. Enjoy the slideshow below of one of our sledding days !!! We love our snowy days of winter, but are definitely feeling ready for spring!! Perhaps today will be our last snow day, but maybe not. Either way, enjoy it while you can. Post in the comments below your child's favorite snowy day activity!! Do you have any special family traditions around snow days? Favorite activity this week! Our younger group of children has had the opportunity to experiment with unused spices and herbs from our garden by mixing them into play dough. Opportunities for broadening vocabulary, social negotiation, and rich sensory experiences have been manifest throughout the play. Over the past couple of weeks, we have been working on a few projects that were initiated by children, and that are great examples of how rich literacy & numeracy learning can emerge naturally from children's interests. One of these projects involves the creation of a giant puzzle. Children have been showing interest in using the big space that we have available to us in lots of different ways, such as building a train track that stretches across all three rooms. After some of these explorations, one child came up with the idea of creating a puzzle that stretched all the way across the school. To start working on the puzzle, a group of children gathered together to share ideas about what it could look like. Several ideas were offered...all the children in the school at a party! The characters from PJ Masks! All the colors of the rainbow! An owl eating grass! We soon realized that we could combine these ideas into one cohesive whole by creating a party scenario with both human and animal guests. I sketched out a layout, and children chose sections of the party to begin working on. Later, other children joined in as well, excitedly drawing a self-portrait to add themselves to the party. Projects such as this one benefit children for many reasons. As an activity that places their ideas as the centerpiece of a learning experience, it provides a sense of empowerment and the capacity to be an active agent in the world. The aspect of telling a story and representing ideas visually is a cornerstone of literacy development, as well as artistic expression. As the project evolves, opportunities for measurement, math concepts, and spatial awareness also come into play, as we try to figure out where exactly the puzzle will fit in our school. Another child-initiated project stemmed from the eternal and important questions of "Who's bringing snack today?" "When is it my turn to bring snack?" I shared with children that we have a snack calendar on the computer, and families write their name down on different days. We decided to make a calendar that we could have in our classroom that children could look at. Two children began working steadily on making calendar boxes and writing the numbers. Sometimes they got stuck, and weren't sure how to write the next number. When that happened, another child working on something else nearby would chime in to help them out. The intrinsic motivation that is evident in these activities makes them powerful learning experiences, and mean that the new information that children encountered in their work is more likely to be retained and integrated into the children's knowledge base. We are looking forward to showing you our work when it's finished! Celebrating Pongal festival with Sita's family! K: It smells like maple syrup. We learned how festivals are very popular in India and how there are many festivals throughout the year. How some festivals like Pongal last 4 days or more. Pongal happens every year from January 14th to January 17th. During those 4 days of the duration of the festival, people do different activities each day. We also heard how people decorate their homes with beautiful "Kolam" designs. Typically they make intricate beautiful paintings on the ground outside their doors. Usually these designs include sugar cane sticks, as seen in this precious one Sowmya made for us. Another friend who wasn't with us during this activity came into the nest later and was pleasantly surprised by it and said: "Wow, that is beautiful, who made that?" The word Pongal means "overflowing". And on the second day of the festival, people boil a pot of milk to share and celebrate the bounty of the harvest. The pots they boiled the milk in, we learned, are also beautifully decorated. The children got a chance to recreate the experience of decorating the pot with construction paper. They loved the wonderful assortment of little things that Sowmya kindly brought for them to use. You can see some of the intricate patters children designed. We are really grateful to Sowmya and Sita for sharing some of their experiences with us and the children. Since Sita joined us, the children have been curious about her and her heritage and Sita has been happy to answer and share her culture with us. Tell us if you do, how do you share other people's experiences and cultures with your children? In the afternoon the older group carried out some projects that were peer led and facilitated. This has been a great way to develop leadership qualities as well as improve group dynamics. One day “I” set out many different items and asked if they could be used to create something as a group. We talked about the different items that could be used and ones that couldn’t and why. I offered some other materials similar to the ones chosen and a project was born. Once the other children arrived in the room I informed the children that “I” had thought of a project for us all to work on as a collective and let her take it from there. She was able to lead the group with teacher guidance when needed. It was beautiful to see the children work together, look to another child to lead, and encourage each other. While the project did not turn into the working helicopter that they had first imagined it was the process that was truly magical. K: “It’s a propeller for the side, like to spin on the side because “I” said that was a good idea. Children were able to use their prior knowledge to offer ideas to better the project. Another peer led project began with K asking if I would learn how to make a specific origami flower she had made at home and teach the other children to make them. She kept meaning to bring the one she created in so I could see what she had in her mind and she would keep forgetting. One day after about a week of her talking about it I set out a bunch of different types of origami paper and asked her to take the lead on teaching her friends how to make the flower. K jumped right in to the leading role in such a gentle and kind way. She was comfortable sharing her ideas. Two other children, M and R, decided to join her. It was beautiful to see the other children listening so intently and asking clarifying questions. As the school year continues I plan to offer more opportunity for peer originated, led, and facilitated projects. There are so many wonderful benefits to this approach. The development of social skills, conflict resolution, teamwork, confidence, leadership, interdependence, and independence are abound here at Catskill Wheelhouse! Since returning from our February break, the kids have been working on building a town. This has involved creating a road, as well as other buildings to add to our town. We've also been using pictures of familiar places in our block area. As children engage in this work, they have been working on representing their ideas symbolically. Their knowledge of themselves in relationship to their world is being refined and expanded as they think about the different locations in their town, and what people do there and how they work together. In addition, children have also been working on spatial concepts, measuring, and other math concepts as they create buildings. We are excited to continue to put together our town in the play room over the coming weeks. What locations do you like to visit in your town? We would love for you to send us pictures of some of your favorite places so that we can add them to our work! It's difficult not to explore sugaring time when Forest Day turns into a discovery of blue pails and hoses running through the woods! Finding buckets and hoses...."What are they!' Children call out as the run through the woods. Once children found out that the buckets were collecting the sweet sap from the maple tree, they pleaded to be lifted up to see inside of them. They quickly put little fingers under the drip, drip, drip of the sweet sap that dripped from the spout. "mmm..." they sighed. Others ran to find where the hoses led them. Our next visit to the woods I asked the children if they would be interested in helping to gather twigs for the fire that would burn under the evaporator and turn the maple sap into maple syrup! I had a handful of very dedicated helpers. In just a short time we had filled the tarp with twigs. Delivering twig offerings to the evaporator for our friends (or Dad for some!) C & R to find. After our taste testing children gathered to hear the story....Gluskabe Changes Maple Syrup. An Abenaki legend about how Gluskabe helps his village appreciate the coming of maple syrup. After our story we headed back to our school on a most delightful "spring like" day! I'm now posting this blog entry just two days after...almost 30 degrees colder and 2 inches of snow! What will our next Forest Day bring? The process of making food together has been a big part of Catskill Wheelhouse since it was first imagined. We took a bit of a break from that this past fall, but began cooking together again last week. It's been so much fun to enjoy food together again. We started off by making banana chocolate milkshakes last week. Today, we squeezed lemons to make lemonade. We love the sense of community and collaboration that cooking projects provide. Older children have been helping younger children, allowing them to feel knowledgeable and competent while the younger ones get to have the experience of a supportive older peer to learn from. Opportunities for language and literacy development abound. Describing tastes and smells, reading recipes, understanding a sequence of events...all of these elements provide the foundational experiences that contribute to strong communication skills. Mathematical understandings naturally make their way into our cooking activities. Counting ingredients supports quantitative understanding, cutting a banana into two pieces provides learning about fractions; measuring cups and spoons help children to learn about volume and measurement. As we cook together, we learn about one another and our world. We learn about likes and dislikes, how we are all different, yet there are some things that we share. We learn about the process and effort that goes into creating the food that we consume. As the weather grows warmer, we will look forward to connecting with seasonal changes and the land around us through produce that we grow and prepare. As we cook and eat, we enjoy sensations, and one another's company. What are some of your favorite cooking activities to do at home? Would you like to plan one of our Food Fridays? Every morning after playing outside, we come together as a group for "meeting time". In our meeting we give time to check in with each other with a greeting song, a message from the teachers, and a provoking closing : a question for the children. Their answers to simple questions such as: What is your favorite forest animal?, What is your parents job? ; can be not only amusing, but so informative of what children already know, what they would like to learn about and do, and influence where the curriculum and activities we present to them might be going. Also, since the start of the school year we have been thinking about how to incorporate Spanish to our days. Naturally the children already notice my accent, and discussions about words pop up here and there. The children have always been wildly curious about how words are said in Spanish. Is wonderful to see their excitement as they hear and repeat words they want to learn or already know in Spanish. As a response to their curiosity, we now have a Word Wall as inspiration with an Spanish side and an English side. In the past few weeks, we have also been talking about Martin Luther King and many conversations have come up, some about big themes on how to be fair, and free and a good leader. If you were in the place of Martin were you saw something you didn't agree with, what would you do? B: I would make art. Z: I would talk to them. L: I would tell them is wrong. P: They let you choose what you want to do. B: They tell good words to people. I: They let people go places they want to go. Z: They lead the parade :). Tell us if any of these conversations have come up at home. It's Friday morning just before we break for Holidays. The day is amazingly mild for late December. The children work at a small patch of ice in the play yard. I take my typical approach to free play and try and busy myself with adult work, putting toys back in their place, checking on the garden, the compost, and really anything that will keep me from disrupting their play. I'm not ignoring the children, but rather giving them space to be their authentic selves. I am listening all the while, but making sure not to interrupt their play. This is truly my most favorite time with children, when they are just exploring the freedoms of life. There is a large stump that's being used as a stovetop. With a metal pot filled with melting ice and mud. The cook is calling out. "I'm poor, can you give me anything?" Two other children are sliding on the ice patch close by when they call out to me, "Cammy, come quick, we found a track, we found a track on the ice." I come over and they show me a shape melted out in the ice. "It's a rabbit foot print, no, it's a squash! We can put it in the soup!" They fall over laughing at the thought and then get to work trying to chop the shape out of the ice with their sticks. The cook continues to stir their soup, and calls out again, " I'm poor, do you have anything for me?" I offer a chunk of ice I've freed from a container and they thank me for it. I go and check the branches on our mulberry bush. Another child has joined the group on the ice patch. There are five now, all within a few feet of each other. I'm really enjoying this scene. The past couple of weeks have been rough for these children, their caregivers, and most likely their parents too! It's December and now late December and celebrations are in the air. These celebrations making everyone a little, well, as one child put it best when they said, "everyone is bitza, bitza, bitza!" They even demonstrated the "bitza, bitza," and lay on their back and rolled around shaking they're arms and legs. "Yes, we all have been a little bitza, bitza! " I reply. Today though, was especially low-key, not that I don't love a little "bitza", but today had this lovely little hum to it and no “bitza”. From the very beginning, to the very end of our day, children were so at ease, so very comfortable with what they were up to. We continued inside with free play and again all these delightful Crickets settled into the playroom, amongst one another, but mostly working on their own. The serenity in the room was tangible. I wondered whether it came from the safety of the space, the bond the Crickets had with one another, or the pure happiness in their own self. I knew It was something very present and it filled my heart. Impromptu exploring of the ukulele was just what one Cricket had been hoping for and some wintry carol singing ensued as well. All these blissful moments wrapped up together became clear to me as the gift of “us”. Each one of us tangled together by our moments with each other, we seemed to have arrived at this spot of unspoken feelings of trust and support. This day was special in so many ways; it also happened to be our winter solstice celebration and Crickets worked on decorations for the occasion. Threading needles ever so carefully they made edible garlands of popcorn and cranberries to hang outside for our bird friends. They also worked on decorating the school for the festivities that would come later in the day. Snowflakes carefully cut out over the past couple of weeks, were hung for all to see. At the end of our day, families joined us outside to decorate our mulberry bush with all the edible lovelies. Then it was back inside for a story, songs, and most definitely dancing! We ended this day with gingerbread decorating (& eating! ), a forest adventure, and a hot chocolate toast to an almost sunset. Many thanks for these delightful Crickets, their light radiating more bright than any sunset! Welcome back to school, everyone! As we move into the month of January, we are constantly noticing all of the ways in which our Crickets have grown since the fall. Every day provides new surprises and milestones. It is so exciting to see children grow and master things that they have been working on! As this process of mastery occurs, children begin to set new challenges for themselves. With these new challenges, calls of "Help me!" echo across the play yard and classrooms. These calls of "Help!" provoke an interesting balancing act for us as teachers. We want the children in our care to always feel supported, comforted, and held by the adults in their lives. We want them to feel that we are always there for them when they need us. At the same time, we also want the children in our care to feel confident and independent. We want to send them the message that we believe in their abilities, that we believe them to be competent and capable individuals who can find their way through all kinds of challenges and overcome all sorts of obstacles. Experiences with setting one's own challenges, then figuring out a way to accomplish one's own goal foster resilience, creativity, and persistence. They are also a big part of the benefit of open-ended play. Motor challenges are a huge area of learning about problem-solving, particularly for our very youngest Crickets. 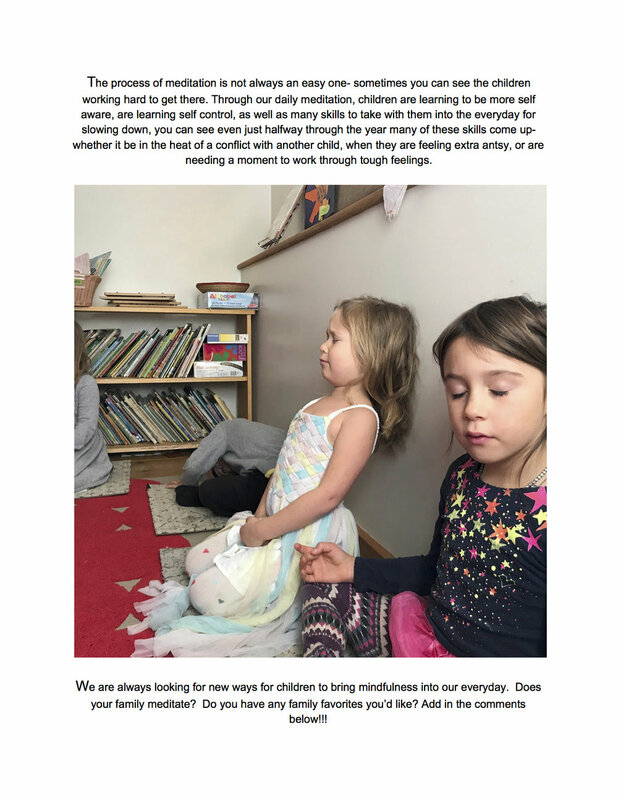 The challenges that children set for themselves are not necessarily the same challenges that adults tend to value, and so observation and a shift in perspective can be necessary to really understand what a child is attempting to do, and to allow them the space to move through their process. Success in the play yard! Hard work to link together tunnel plus car, then climb all the way through! Success with paint! "I made yellow!" What happens when they really can't do it? This may involve a joint judgment call between the teacher and child. Teachers attempt to provide just enough assistance for a child to accomplish the goal on their own. But sometimes, children decide that they are finished with that particular challenge, and move on to something else. At times, teachers might give a little push, but at other times, we choose to respect a child's decision to walk away from something that no longer feels important to them. Through self-determined challenges, children learn their own limits, and figure out how to work with them. For this reason, we do not always lift a child onto a swing, climber, or tree branch that they quite do on their own yet, even if other children are doing so. They learn to make choices, to decide what is worth spending their time on. They learn to be comfortable with who they are, where they are at, and to be ok with the fact that while some things come easy, others may require a lot of work and effort. So the next time you see Wheelhouse teachers watching and smiling while your child cries "Help!" or grunts in frustration, please know that it's not out of cold-heartedness! It's because we have seen firsthand the pride that come from figuring something out on their own, we treasure those experiences for the children in our care, and we want to do everything we possibly can to provide opportunities for that joyful thrill. We wait, and are often rewarded by another cry echoing across the play yard... "Look! I did it!" Making decisions together and future action project! Z raises his hand: Well, what if we clean up our lunch and go to the cubby room. L: What if we clean our puzzles all together quickly and go get ready for outside. Teacher: And you are saying we clean together. What does everyone thinks of these options? Teacher: So it sounds like we are all going to help each other clean up faster so we can go outside faster. 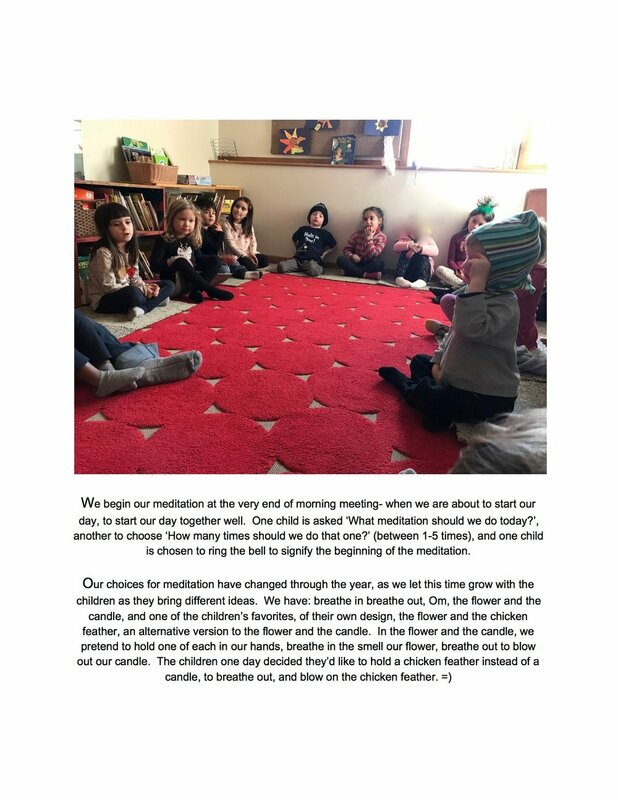 Discussions like this one happen often at Wheelhouse, where we make decisions together with the children about how to solve problems that arise in the flow of our days. Adults take into account children's ideas and facilitate the road to making a desicion that affects all of us. Another tool we use for making decisions is voting. Like at the beginning of the school year when we chose the name of Crickets for our class. The teachers brought some suggestions, and children used voting to determine what our class name would be. We had wooly bears, crickets, and dragonflies. We asked children to raise their hand for each name, counted together, and picked the name with the biggest number: Crickets. Because you need a talking stick when you are having a discussion and everyone wants to be heard..
We see that children can be active members of communities and society. That is why we encourage and acknowledge their capacity to deal with problems. Coming up in January we are going to start working on an action project where we will identify an issue or a problem that the children care about, and use a multistep process to learn more about it, and to find potential ways of solving it. We would like to spend as much as it takes on this venture, allowing space and time for more learning together. If you were in charge of the play yard at school, how would you make it better? Or if you were in charge of the earth what would you do to make it a better place to be? We are looking forward to starting this new journey with the children and see where it take us!! The colder weather over the past week has provided lots of opportunities to explore the science and art of ice and snow. Children have been busy building with colored ice blocks, creating "food in their dramatic play stories with colored ice cubes, and playing in the snow. Learning about these physical changes in states of matter has been entwined with aesthetic observations, as well as sensory delight. See below for some pictures of the Wheelhouse Winter Wonderland!